We are two months out of transplant and a few weeks ago Jason seemed to have a breakthrough—he got on some pain medication that really helped him and his recovery improved greatly. We have had some bumps in the road to be sure (very slight rejection, a very small amount of donor-specific antibodies, an old infection that grew in his old lungs lingering in his body and creeping into the new, etc) but with the help of Duke's fantastic team we have been able to get all proactive on all that shtuff to ensure it didn't develop into something more serious. In fact, for the past couple weeks he has felt better and better each day—and last week he was even proclaiming he was "starting to feel like his old self again"! And then we came back to Durham and were welcomed by a full day of pre-op appointments yesterday and a Nissen Fundoplication today, with a side of another long, yucky recovery. Hip hip! I spoke with the surgeon (Dr. Hartwig, who looks very much like a thin Clark Kent–Superman, and is probably the friendliest surgeon we've ever met). The surgery went very well. Took longer than usual because of some big artery they had to work around, but went well. Then I went into recovery and saw Jas, who was doing good and very medicated. I happened to catch this conversation with his nurse man, "Hey, I really like your gray pants." Nurse man looked at his gray scrubs and said "'Preciate it." Jas just nodded his dopey little head and said "Yeah... I wish I had pants." The fact that he was lying there fully naked under his gown and blanket continued to disturb him for the next few minutes. Next he tried to "count the ways he loved me". Number one being "you have beautiful hair" ? Number two, "you take real nice care of me". Number three "you love me". Number four "you're kind". Number five "you have bosoms to be envied" ?? (Emily Dickinson would be so proud)... and so on until he managed to get his hands on his phone and moved onto trying to navigate Facebook and read comments... now that is something I wish I had recorded. And speaking of goofy Jason, I thought I might share a little treat I whipped up. 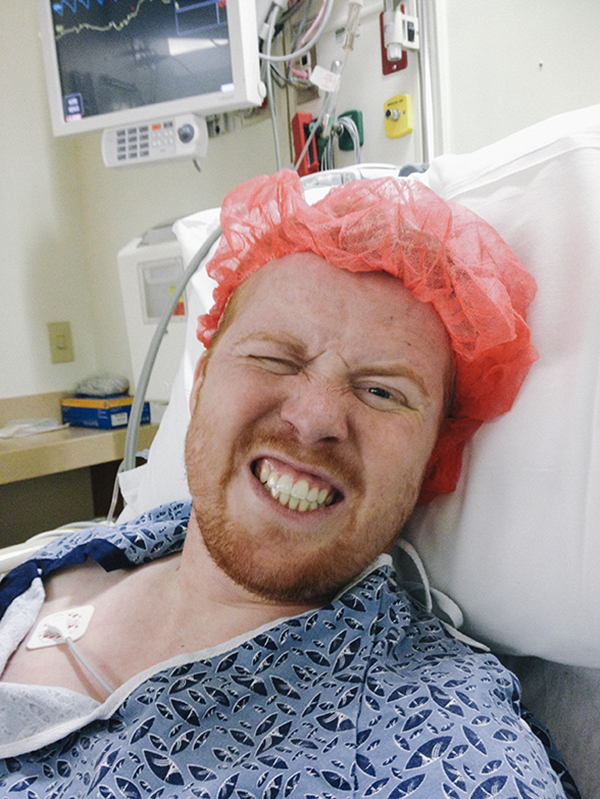 Earlier today, just before surgery. ... and as they wheeled him away to the OR he was whistle-humming the Indiana Jones theme song... very loudly. LOVE IT! hahaha. "I wish I had pants" -too funny. You guys are so strong and so amazing. Glad things are seriously looking up and hope this long recovery is bearable. I work for Duke!!! Next time you are here you should send me an email and I'll stop by to say hello. Was this surgery a planned part of the transplant? Hope the recovery is quick. LOL oh my so so so cute!!! how did you create you gif image!?! i have been trying to figure it out for weeks! !